Just a quick post to say hi and to wish you a very happy Memorial Day weekend. We will be spending it with family at the beach. It will be a nice break for me from projects and the weather is supposed to be fabulous. Good times! Just wanted to show you the blog badge I asked sweet Laurie to make for me for Farm Chicks. She and Kim from Camp Whimsy came up with the idea to wear badges so that other bloggers will know who we are. What fun! I love how it turned out. I just knew Laurie would do a great job. Can't wait to wear it! Thanks again Laurie for making this for me. It's perfect! Will be back next week with more projects. Two weeks to go til FC's! Beautiful badge Lisa! That Laurie is one talented girl!! Can't wait to meet you at the Farm Chicks! I'll look for your badge! oooh! Very pretty! She did a great job! How stunning and what a great idea, Laurie has quite the talent! Enjoy your weekend at the beach!! Love the badge!!! I am busy making myself one to wear. I am heading to the Farm Chicks Show in a couple of weeks, too! I am sure it will be wonderful!! Glad you like the badge. I really had fun making it using things that I really thought you would love....a little bling and some old pink ribbon handmade roses (estate sale find)! Have a great weekend...take a break from the Farm Chick prep. Oh that is absolutely gorgeous! !LOVE.LOVE.LOVE the colors!! PS: Have a fun time at the beach!!!!!!!! Dig your toes in the sand for me! Wow Laurie sure did a fantastic job I just love that girls style just charmin! Lisa, we are off to Farm Chicks too in a few weeks. It sure crept up fast, didn't it? I have a grandson arriving around June 1, so I am praying that he will come before or after the Chicks show so I can be in attendance for both events. Will miss the Chicks of course if necessary. Where do you reside? I am in Lake Oswego and my partner in crime is in Beaverton. Can't wait to meet you and so many others! I am just crazy about your blog and want to visit often for all your creativity and inspiration. Please visit and if you like what you see, just click "Follow" button. Also, if you would like to add my blog to your list of favorites, please do so so that we can inspire each other frequently. Stay a while and browse and see some of my creations from painting to re purposing items to Italian Recipes! this badge is so pretty..i love it. Can you really call that a badge? That is more like a corsage or a Miss America banner! I love it...it is gorgeous. What a fun and creative idea. The badge is over the top amazing. 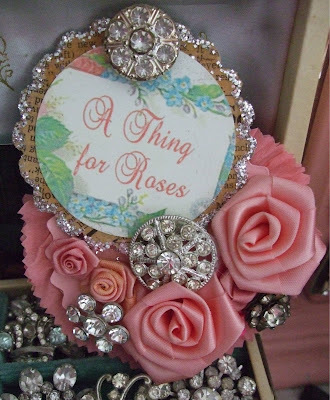 Love the roses and the rhinestones. It's one of the prettiest badges I have ever seen. I think Laurie did a wonderful job. It would be nice to see it on you. Yummy! Beautiful and what fun is ahead of you. Can't wait to hear all about it. Let's say you didn't have an iphone and you wanted one? What is a fair price to sell a slightly used iphone and also an iphone2?